Users of 3DNature’s landscape visualization software like World Construction Set ($500) and the more GIS-friendly Visual Nature Studio ($2,475) can export their work to other file formats using Scene Express ($399-$699). Vegetation is implemented as KML Icons. Google Earth seems to bias Icons slightly closer to the camera when deciding if they are or are not visible behind structures like buildings. This results in vegetation sometimes being visible through buildings. Also, Icons maintain their apparent screen size no matter how close or far away you are from them, so they only properly represent their real-world sizes at a certain range of distances. But Google Earth is not indended to be used from just a certain range of distances. Had this been an experimental hack, I would have cheered it on, but for a pro tool, I think that using icons for something they are not intended to represent is not a good idea. The problem is most apparent in the Adirondacks KMZ file, where icons are are made huge in order to represent text as a bitmapped graphic. 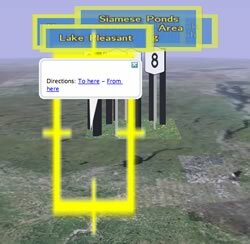 Why do this, if in Google Earth icons have proper (searchable) text labels? (I suspect the answer is that those bitmaps already existed in VNS.) The upshot is that huge parts of Google Earth’s view screen are not usable to “grab” the earth and navigate — you accidentally click the icons instead, which brings up an oft-unused popup. For projects that require high-detail realtime 3D visualization but don’t require a full 3D globe, we recommend other formats/viewers such as our [free, Windows] NatureView, which was specifically developed for these types of scenes. Hi there, Chris from 3D Nature here. You’re correct in that translating our more extensive visualization capabilities into KML has been a challenge. We use icons only because they are the only KML entitiy that permits us to place billboarded things that look like trees. You are also correct in assuming that we use our bitmapped “Labels” instead of KML’s own labels only because we’re trying to preserve as close to a 1:1 relationship between the original scene and the GE/KML scene as possible. We might add an option to translate them into text if the user wishes. We too have hopes for improvements, but we’ve received absolutely zero assistance or cooperation from Google themselves, despite our inquiries. There may be better ways of accomplishing some of what we’re trying do, but until Google opens up and tells us, we believe this is the best possible result. Nonetheless, it’s still a heck of a useful capability that we didn’t have before, plus it’s free for our existing Scene Express users.